It was a beautiful night for racing at the Dacotah Speedway on Friday, August 7th. With only a few weeks left in the season, the intensity on track picked up as every position was more important than the last. A 10 lap IMCA Sport Compact feature kicked off the night just before intermission. Stan Thompson and Joshua Houn started on the front row. However, young Dylan Sandberg bursted into the lead on the start but over drove turn two, allowing Jason Berg to pull along side. They raced door to door for the lead as Chase Schlafmann quickly reeled in the leaders. Sandberg cleared Berg to hang onto the lead as Berg and Schlafmann battled for se cond. A lap five caution regrouped the field and under the caution, Schlafmann lost a right rear wheel, ending his night early. On the restart, Kody Stoxen powered into the lead as Sandberg got loose and slammed into the driver side of Chance Seelye. On the final restart with four laps to go, it was a three wide battle for the win between Stoxen, Berg and points leader Josh Roehrich. Going into turn one, Stoxen and Berg made contact, allowing Roehrich to slip by into the lead and pull away. Roehrich led the final three laps to win his fifth feature of the year. Kody Stoxen settled for second as Jason Berg held off Brandon Anderson for third. Alex Thompson finished a season best of fifth place. John Gartner Jr grabbed the lead from pole sitter Robert Sigman in the Hobby Stock feature. As Gartner Jr pulled away from the field, Sigman and Josh Anderson battled for second. Sigman's car started to fade through the field, losing positions to Brent Vetter, Nathan Messer and Jaren Wald. A debris caution on lap five reset the field and on the restart, Gartner Jr pulled away from the field again. Anderson and Messer raced side by side for second before Wald make it a three car battle. Messer got too high in turn two allowing Vetter to drive by for fourth as Anderson and Wald continued to race for second. With five laps to go, Nick Schweiger's car came to a stop in turn four before bursting into flames underneath the hood. On the final restart, Anderson and Wald dove low under Gartner Jr for the win. However, Gartner Jr's high line around the track gave him the drive off the corner to clear both Anderson and Wald for the lead. Anderson took second from Wald and started inching closer to Gartner Jr but got loose out of turn four coming to the white flag. Wald drove by Anderson but Anderson made a last lap charge to retake the position. 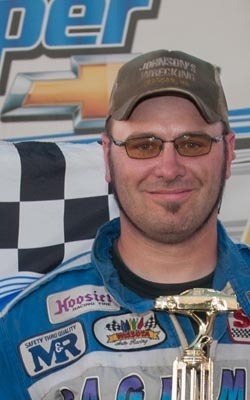 Wald held off Anderson by a car length to finish second behind feature winner John Gartner Jr. 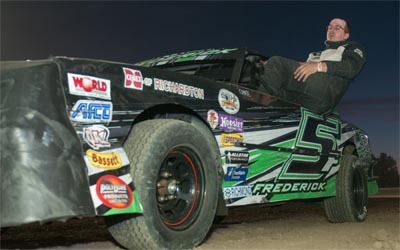 Points leader Wyatt Rath-Wald's four race winning streak came to an end as he finished fourth ahead of fifth place Brent Vetter. In the INEX Legends feature, Minot's Shane Williams went from ninth to first on lap one. While racing for second, Nate Keena's car made contact with Tom Wagner, collecting points leader Donavin Wiest, Monte Gawryluk and Dallas Maas on a lap two. On the restart, Troy Hoff of Flasher passed Wagner for second and challenged Williams for the lead. As Wagner tried to hold off Dauntae Martin for third, Kevin Jensen had his hands full with a fast Paul Morman and Drew Papke for fifth. They raced three wide before Papke shuffled into fifth with six laps to go. Despite being the fastest car on the track, Hoff struggled to get around Williams for the lead. Hoff dove low under Williams but could not make his car stick. 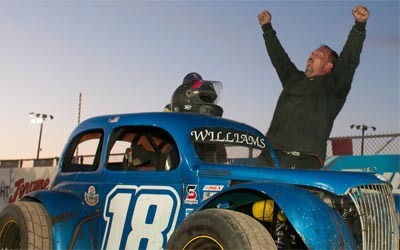 Hoff then started changing his line, each lap racing a little higher than the last but Williams held on to win his second feature in a row at the Dacotah Speedway. Tom Wagner, who was involved in the lap two caution, finished third ahead of Dauntae Martin and Drew Papke. Nick Desplinter led from the pole in the WISSOTA Street Stock feature. It was three wide behind him for second between Matt Brendel, Matt Dosch and Zach Frederick. Frederick shuffled into second and into the lead by lap three as Desplinter tried to hold off Brendel for second. Desplinter fell through the field losing positions to Shawn Volk, Travis Ulmer and Matt Dosch. Frederick checked out on the field, opening a huge lead and started catching lapped traffic. However, Frederick's lead was erased when Jeremy Schmidt's car spun in turn two with eight laps to go. On the restart, Ulmer dove low under Volk and raced Brendel for second before another caution slowed the pace. It was a four wide battle for the lead on the restart between Frederick, Brendel, Ulmer and Volk but Frederick held onto the lead before yet another caution reset the field. The late race cautions helped Dosch and Scott Gartner as they cracked the top three but hurt Ulmer and Volk as they faded at the end. On the final restart with three laps to go, Frederick pulled away from Dosch and Gartner to win his second feature victory of the season. Matt Brendel held off Dustin Frank to finish fourth. In the final feature of the evening, Travis Olheiser and Brent Schlafmann started on the front row of the IMCA Modified feature. Schlafmann grabbed the lead as Jordan Huettl and Travis Ulmer made contact in turn one, ending Ulmer's night early. Huettl was able to continue as he raced Tracy Domagala for second on the restart. Racing next to the guardrail, Spencer Wilson passed both Domagala and Huettl and quickly caught Schlafmann for the lead. Wilson muscled into the lead, bringing Huettl with him on lap five. Huettl challenged Wilson for the lead and they briefly raced door to door before Huettl took the lead on lap eight. Wilson rallied back to race along side Huettl for the lead but Huettl shut the door. While trying to maneuver through lapped traffic, Wilson dove low under Huettl and into the lead but the car didn't stick and he washed up the track and into a lapped car. At the very same time, Dylan Barnhardt also spun his car around. The caution was charged to Barnhardt and on the restart, Wilson's wounded car was slow to go which caused a huge wreck behind him involving the points leaders Marlyn Seidler, Shawn Strand and Tracy Domagala. 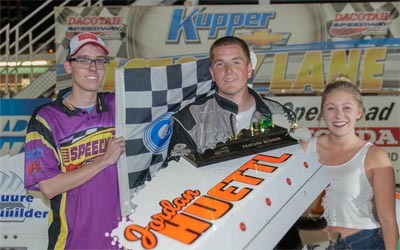 On the restart, Jeremy Keller battled Huettl for the win but got too high in turn four, allowing Mark Dahl to slip by. 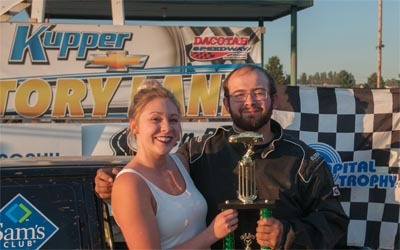 Dahl quickly caught Huettl but ran out of time as Huettl picked up his first feature Modified win at the Dacotah Speedway. Shawn Strand's heavily damaged car finished third as Jeremy Keller and Tracy Domagala rounded out the top five. The road to the 2015 Season Championship night continues this Friday, August 14th presented by Prairie Knights Casino and Resort. It’s also “Buck Off Bud” night. Get one dollar off on Budweiser and Bud Light’s.